On a live broadcast of TV Tokyo’s “Hello! Morning” program, we were told we successfully passed. That day was perfectly split between the me who hadn’t yet joined Hello! Project, and the me who had joined. I’ve thought about various things every day. I suddenly felt like reading old fan letters. These were my thoughts while reading them. The people who wrote those letters back then probably aren’t fans anymore. Surely, they don’t read this blog either, I think. Even so, now, after 10 years have passed, I want to show my gratitude to those we’ve seperated from too. And then, everyone who is supporting us now. When I feel everyone’s warm affection, I want to make everyone even more happy I want to grow more I feel. I’ve been saved by everyone time and time again. Our source of power to do our best, without a doubt, is everyone. Our 10th anniversary, which we were able to reach because of everyone’s support, falls on the same day as the ℃-ute tour’s closing day. It was something I couldn’t imagine 10 years ago. and then my family. And then my colleagues. And then, and then, all of the fans. 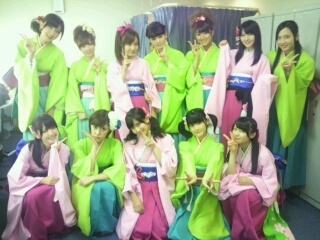 Posted on June 29, 2012, in Blog, Translations and tagged Yajima Maimi. Bookmark the permalink. 1 Comment. Reblogged this on ~Maimi's Wonderland~.